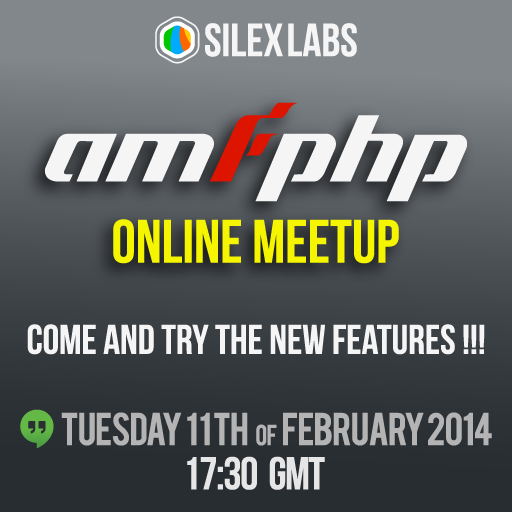 Amfphp online meetup, come and try the new features! Amfphp 2.2 Profiler is now available, hopefully you’ve recovered form your end of year celebrations, and now Silex Labs is proud to present the first Amfphp online event! A training session to try the new features, for as long as necessary. You’ll need a running PHP server with Amfphp on it. This will take place on Google Hangout on Tuesday 11th of February 2014 17:30 GMT. To take part please sign up on Eventbrite. This is a first, so space is limited to 10 participants. So hurry if you want to be there! To know at what time this is for you locally, have a look here. « Atelier Git : Push toi de là que je m’y merge ! !